Ban Ki Moon, the Secretary General of the UN, has visited the Semipalatinsk Nuclear Test Site in Kazakhstan, as part of a tour of the whole region. Euronews caught up with him near Ground Zero. Denis Loctier, Euronews: – Mr Secretary-General, welcome to Euronews. You’re visiting the site of 456 nuclear explosions. How do you feel about that? Ban Ki Moon: – It’s a sobering experience for me, to stand on the Ground Zero where so many nuclear tests were conducted. I was told that 456 nuclear tests were conducted here with a terrible effect on human lives and environmental consequences. We should not repeat this kind of legacy – this is an awful legacy. And I highly commend the extraordinary leadership of president Nazarbayev of Kazakhstan, who courageously closed this nuclear test site and initiated the nuclear weapon-free zone in Central Asia. That’s a big milestone. Euronews: – Speaking about milestones, your visit coincides with the signing of the new START treaty. The United States and Russia are cutting down their nuclear arsenals, although they are keeping enough warheads to kill all life on the planet. So, really, how much safer are we now? Ban Ki Moon: – The international community is committed to realising a world free of nuclear weapons and non-proliferation; this is what we must achieve without any further delay. I’m going to urge nuclear weapon states leaders in Washington DC next week, when I’m attending the Nuclear Disarmament summit meeting, to take political and moral responsibility. We do not need any more nuclear weapons. In that regard, I highly commend president Medvedev of the Russian Federation and president Obama of the United States who signed this successor treaty to START. This is a fresh start, and I hope other nuclear weapons states leaders will follow suit. Euronews: – And do you think this new START treaty will be reflected somehow on the non-proliferation efforts, especially concerning the Iranian issue? Ban Ki Moon: – I’m convinced that this encouraging development of the situation in the arena of nuclear disarmament and non-proliferation will certainly have a positive impact on our ongoing and continuing efforts to realise a world without nuclear weapons, including the Iranian nuclear development programme. Euronews: – All right. Speaking about your visit around this Central Asian region; you have come here after visiting four other republics of this region, notorious for lack of respect to human rights and democratic standards. So far, their leaders have mostly ignored the criticism. Do you think they will ignore yours? Ban Ki Moon: – As the Secretary-General of the United Nations, I have a broad responsibility, a mandate, to protect and promote human rights. Human rights are universally valued. I have urged in unambiguous terms all the leaders of Central Asia to protect human rights, to protect vulnerable people, and to implement all the conventions and the international agreements to which they have signed. This is a moral obligation and an imperative – that leaders should realise that human rights is a universally-accepted principle and value of human beings. Euronews: – And what was their reaction to your urging? Ban Ki Moon: – I’m convinced that they have heard clear and loud my message, from the Secretary-General of the United Nations, to promote and implement all the obligations on the international human rights laws and treaties. 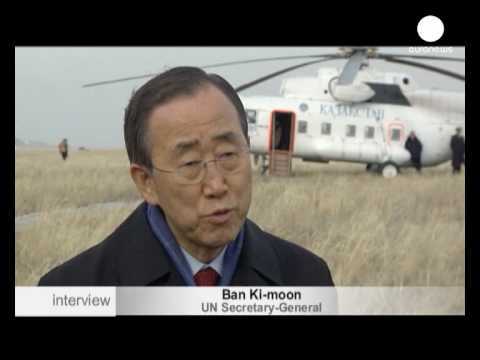 Euronews: – Thank you for your interview, Mr Secretary-General. Ban Ki Moon: – Thank you very much.